Cuts through PVC pipe in seconds! Faster & easier than a hacksaw, ideal for tight spots and in-ground repairs. 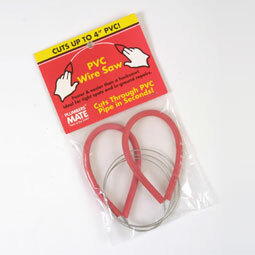 • Pass cutting wire around pipe or conduit. • Pull wire taught - starting the cut requires firm tension and very small strokes. • As wire begins cutting ease tension and begin long even strokes. Hedgehog New Zealand (NZ) PVC Wire Cutter / Saw cuts through PVC pipe in seconds!